Ed Simon is the Editor-at-Large for The Marginalia Review of Books, a channel of The Los Angeles Review of Books. A frequent contributor at several sites, his collection America and Other Fictions: On Radical Faith and Post Religion will be released by Zero Books in November of 2018. He can be followed at his website or on Twitter @WithEdSimon. King Charles I of England, frustrated at the limitations of his otherwise powerful position, decided to dissolve Parliament in March of 1629 and to clap several of the opposition’s leaders in irons. The monarch had come to an impasse over issues as lofty as religious conformity and as mundane as the regulations concerning tonnage, eventually finding it easier to simply dissolve the gathering than to negotiate with them. Historian Michael Braddick explains that the “King was not willing to assent to necessary measures” in governance, and that Charles was intent on “upholding his right to withhold consent” as he saw it, believing that “without that power he was no longer a king in a meaningful sense.” Charles was a committed partisan of the divine right of kings, truly believing himself to be ennobled to rule by fiat, and regarding legislators as at best an annoyance, and at worst as actively contravening the rule of God. Meanwhile, Trump claims that his proposed border wall with Mexico is a national security issue, and after two years of inaction on his unpopular signature campaign promise has decided, not uncoincidentally following the election of a Democratic House, that he’ll invoke sweeping emergency powers to construct said wall, which last month Jennifer De Pinto and Anthony Salvanto of CBS News reported 59% of Americans oppose. At the time of this writing it’s unclear as to if Trump will declare those broad executive powers, in an audacious power-grab not dissimilar to Charles’ petulant dissolution of Parliament. Yet as much fun as it is to draw parallels between the events of the 17th century and our current predicament, we must avoid the overly extended metaphor. 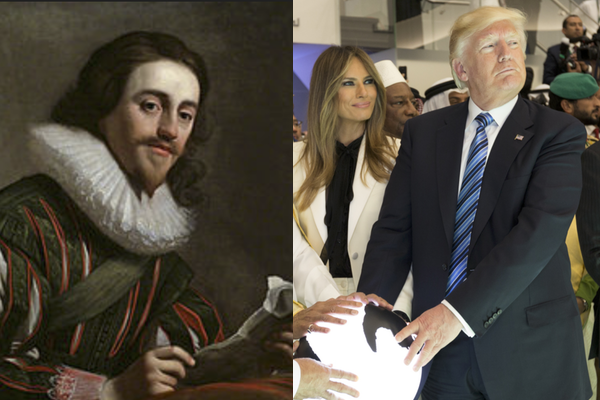 Trump is not Charles I; Pelosi is not the anti-Royalist John Pym; the Republicans are not Cavaliers and the Democrats are not Parliamentarians. Treating history as a mirror can obscure as much as illuminate, and yet I’d argue that the past does have something to say to the present, especially as we understand the ways in which American governance is indebted to understandings of those earlier disputes. Political pollster and amateur historian Kevin Phillips argued that the English civil wars set a template for perennial political conflict in his 1998 book The Cousins’ Wars: Religion, Politics, & the Triumph of Anglo-America. With much controversy, Phillips argued that a series of conflicts between the 17th and 19th centuries should best be understood as connected to one another, analyzing how “three great internal wars seeded each other,” with the “English Civil War… [laying] the groundwork for the American Revolution” which “in turn, laid the groundwork for a new independent republic split by slavery” that would be torn asunder during the American Civil War. For Phillips, modern Anglo-American history should be interpreted as a Manichean battle between two broad ideologies, which manifested themselves differently in each conflict while preserving intellectual continuities with their forebearers. Basing his analysis on geography and demography, Phillips sees in Charles’ claims of Stuart absolutism and religious conformity the arguments of King George III in the American Revolution, or the aristocratic defenses of inequity offered by the Southern planter class in the American Civil War. As a corollary, in the Parliamentarian he sees the language of “ancient liberties” as embraced by the American revolutionaries, or the rhetoric of New England abolitionists in the antebellum era. The first position historically emphasizes order, hierarchy, and tradition, while the second individualism, justice, equality, and liberty. There’s much that is convincing in Phillip’s claims. The American revolutionaries certainly looked back to thinkers like Milton; the Puritanism of the Parliamentarians was crucial in both revolutionary and antebellum New England in terms of crafting a language of rebellion. The Southern aristocrats and apologists of slavery during the American Civil War consciously compared themselves to Charles’ Cavaliers, and rejected the creed as spelled out in the United States’ founding documents as evidence of heretical non-conformism. Thus applying Phillips’ to the current divisions in the United States has a logic to it. If the American Revolution continued the same debates from the 17th century English civil wars (and it in part did), and the American Civil War was born from the contradictions of the Revolution (which is undeniably true), then it might follow that the current divisions in our country are a continuation of the American Civil War by other means. In this perspective, Trump is a kind of Copperhead President, a northern Confederate sympathizer as argued convincingly by Rebecca Solnit in The Guardian. While acknowledging that there is much that’s valuable in Phillips’ interpretation, I prefer rather to draw a different lesson entirely. Without comment as to the causal relationships between those conflicts, I rather note a particular structure by which each one of them unfolds, an ur-narrative which for progressives is incredibly important to be aware of as we may soon be facing a period of unrivaled opportunity for enacting profound change. Returning to the 17th century, parallels to today can be seen in the Parliamentarian view that Charles was both an incompetent monarch and an aspiring tyrant, an illegitimate ruler enraptured by foreign influence. Had it not been for his own petulant intransigence Charles may have been able to weather those political storms, but it was precisely his own sense of inviolate authority which made his downfall inevitable. Charles’ fall from power, in turn, heralded a period of incredible potential for radical change in English history. Historian David Horspool writes that this discourse was “of a kind never before witnessed in England: an open debate” on how the new Republic should be governed. Occasions like the Putney Debates, held by the New Model Army, put front and center issues of republican liberties that had been marginal before, such as the participant Thomas Rainsborough who declared that “Every person in England hath as clear a right to elect his Representative as the greatest person in England.” Meanwhile, religious radicals like the Levellers and the Diggers, the former of whom had sizable support in both the army and Parliament, suggested communitarian economic arrangements, whereby the commons would be restituted as the property of all Englishmen, views that would still be radical today. Such is the primordial narrative: an ineffectual and reactionary leader makes attempts at increasingly more power which triggers a crisis that leads to his downfall while presenting the opportunity for unprecedented, radical political change from the opposition. Had Charles been less vainglorious, perhaps the civil wars could have been avoided, but he was and as a result what ultimately presented itself was the possibility of something far more daring than mere incremental change. The same template is in evidence during the American Revolution. Had moderate voices like Prime Minister William Pitt been heeded, had George III been less intemperate regarding the imposition of the Intolerable Acts, than perhaps America would still simply be part of the British Empire. As it was, the hardening of George’s position allowed for the introduction into the world of the radical democratic philosophy which defined the American Revolution, and which flowered during the Articles of Confederation when many states adopted shockingly egalitarian constitutions. Similarly, on the eve of the American Civil War, most northerners were not abolitionists, yet increasing belligerence from the Southern slave-owning class, in the form of the Missouri Compromise and especially the Fugitive Slave Act, rapidly radicalized the northern population. In the years following the Civil War there was radical possibility in Reconstruction, when true democratic principles were installed in southern states for the first time. We’ve already seen the arrival of new radical possibilities in opposition to the reactionary leader. Does anyone credibly think that we’d have elected several Democratic Socialists were it not for Trump? Does anyone believe that we’d finally be able to consider policy proposals like Representative Alexandria Ocasio-Cortez’s Green New Deal, and the restitution of a proper marginal tax rate, had it not been for the rightful frustration and anger at the reactionary Republican agenda? Suddenly the Democrats are suggesting actual ideas and not just the furtherance of the collapsing neo-liberal consensus; suddenly it seems as if actual change might be possible. In this sense, Trump has ironically accomplished something that the Democrats themselves haven’t been able to do – he’s pushed them to the left. But I must present a warning as well, for there is another part to those narratives. Writing of the English civil wars, historian Frank McLynn explains that those years “undoubtedly constituted a revolutionary moment, a time when, in principle, momentous changes were possible.” Yet the English civil wars’ radical promise was never realized, betrayed by the reactionary Lord Protector Oliver Cromwell, and among the radical participants in that revolution they were done in by “the besetting sin of the Left through the ages – internal factionalism and squabbling instead of concentrating on the common enemy.” The result would be the demagoguery of Interregnum and finally the Restoration of the monarchy. Similar preclusion of democratic possibility occurred in the 18th Century United States, when the radical politics of the Revolution would be tempered at the Constitutional Convention of 1787, with the drafting of a document that abolitionist William Lloyd Garrison famously described as “an agreement with Hell.” Post-Civil War Reconstruction, often cynically and incorrectly presented as a manifestation of draconian Yankee opportunism, was a hopeful interlude drawn to a close by Congress’ 1877 betrayal, the ramifications of which define our politics today. Consequently, there is a central question which the left must ask itself. It’s no longer if Trump will fall, it’s the question of what opportunities will be taken by progressives once he does. Trump’s gross incompetence and unpopularity has done more to discredit right-wing ideas than decades of liberal punditry. Clearly, we cannot afford to retreat to bland centrist moderation when the tide of history seems to call for more radical proposals. But the historical template provides warning, especially about how quickly hopeful moments can be squandered and reversed. A king’s greatest weakness is that he too often actually believes in his divine right. To be effective we can never be as stupidly arrogant. Now, what will we do with this moment?